Ron Kaufman with President George H.W. Bush in February 1992. In 1977, I was a 33-year-old kid from Quincy and had worked my way up to be the manager of a local grocery store. Holding multiple jobs — from garbage collector to grocery bagger — I helped send my two sisters to college, but I never earned a degree. It was after I became store manager that I met state Representative Andy Card from Holbrook and began getting involved in local politics. Card had ambitions to be governor, and I wanted to help him get there. I also had ambitions to marry his younger sister; at the time, this was a longer shot than a Governor Card! In order to get a statewide platform for a future gubernatorial run, Card and I decided we would manage a Massachusetts primary for a presidential candidate. We debated between US Senate minority leader Howard Baker and George H.W. Bush. Baker, with deep party connections, was the obvious choice, but after meeting with them both, we went with Bush. Not because his resume was impressive — CIA director, diplomat, and congressman — or that he had a keen sense of operational politics. In the end, we connected with the man. After our meeting, as Bush walked us out of the building, there was Card’s sister, by then my wife, sitting in the car waiting to pick us up. Bush walked past us and over to the car. He knocked on the window to meet her. He cared about the whole of who we were: our lives, our families, us as humans, not just guys who would work for him. And from that meeting forward, my life and my family became inextricably linked to Bush. We put together our team of young, bright state reps: Andrew Natsios, Paul Cellucci, Leon Lombardi, Card, and me. We sent Bush’s campaign manager, Jim Baker, our strategy to deliver Massachusetts for Bush. Baker approved, and we went about crisscrossing the state, setting up phone banks, and not sleeping for days. But we were like a family — those were some of the best times of my life. I remember one day I walked into our headquarters office in Boston and there was Barbara Bush with a broom, sweeping the floor. I remember dragging their daughter Doro, a shy, 19-year-old Boston College student, to coffee houses and nursing homes to talk about her dad. After losing to Ronald Reagan in New Hampshire, we pulled a surprising upset and won Massachusetts for Bush by about 1,000 votes. Baker then sent me to Connecticut, Pennsylvania, and Michigan. We won them all. Over that time, I fell in love with candidate Bush. He was smart, experienced, tough, and hard-working. While beating expectations, the Bush campaign was no match for the Reagan revolution. On the eve of the final day of the 1980 Republican convention, Bush invited my wife and me to his Detroit hotel room to thank us for all we had done. From those early days in Massachusetts until his death, President Bush treated me like family. He never cared that I was a grocery store guy from Quincy. He valued my loyalty and returned it with his, allowing me eventually to serve as his director for White House personnel and then as White House political director when he was president. And mine was not the only life transformed: Lombardi became a state judge; Natsios served as director of USAID; Cellucci became governor of Massachusetts and then US ambassador to Canada; and Card served as President H.W. Bush’s deputy chief of staff and then secretary of transportation, and later as President George W. Bush’s chief of staff. Those days in the White House were the highlight of my career, but the highlight of my friendship with the elder Bush came over the many years that followed. From Houston to Kennebunkport, the Bush family never forgot the people who worked for them, and they involved us in their lives. The Bushes value family. Any father can tell you that the ultimate appreciation you feel is when someone is kind to your child. President Bush didn’t just accept me as family — he loved my family as well. He got to know my two daughters, sent them birthday cards, and invited us to events. When my youngest daughter pursued a career in US-China relations, he sent her the book “The Art of War” on a wooden scroll that President Jiang Zemin of China had given him when he was president. Of course, the book included a signature note of encouragement from Bush. This is the kind of generosity and thoughtfulness that can only be understood by the anecdotes of the thousands of people whose lives he enriched. And in the case of a poor kid from Quincy, a life he completely transformed. 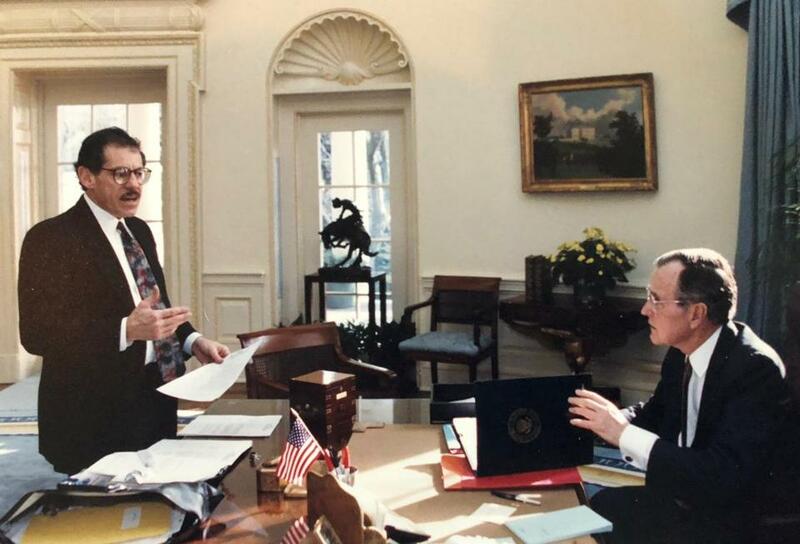 Ron Kaufman was director of White House personnel under George H.W. Bush.